First, after God created animals (days 5 and 6 in Genesis 1), He called them “good.” He said the same thing about light and land and seas and plants—all were “good,” and all are things we expect to see in the future in what Scripture calls the new heavens and new earth. Second, animals were in the pre-Fall Garden of Eden—which is a picture of what creation not only should look like but will again someday. Before sin entered the world, Adam named the animals (Genesis 2:20). He perhaps petted the goats, ran with the gazelles, and even climbed high onto a giraffe’s neck. Third, the prophet Isaiah used animals to describe God’s future Kingdom: “The wolf shall dwell with the lamb, and the leopard shall lie down with the young goat, and the calf and the lion and the fattened calf together ….” (Isaiah 11:6). Not only will there be animals, but they will be tame. 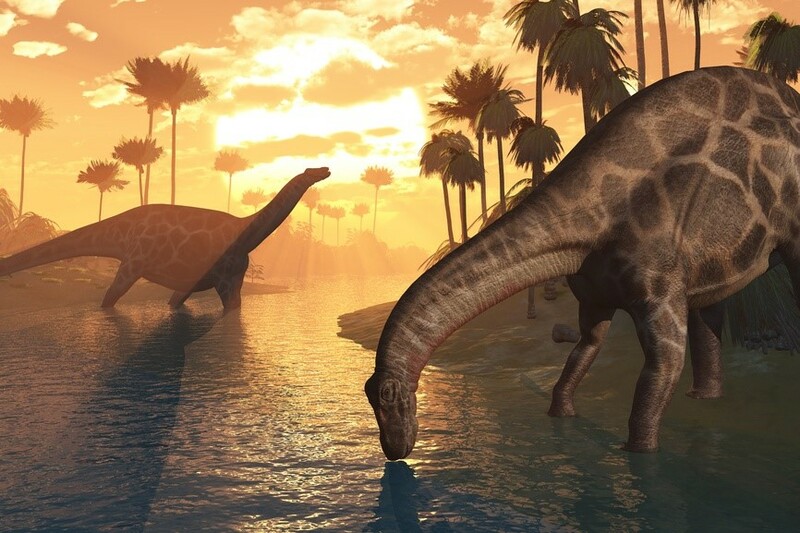 So animals will be in heaven, but what about dinosaurs? To answer that, we have to use a bit of Scripture, a touch of philosophy, and even some common sense. Romans 8:19 tells us that “creation waits with eager longing” for the return of Christ when “creation itself will be set free.” In other words, creation will be restored to God’s original intent. If we believe that animals will be in heaven, then why wouldn’t we believe that every animal that God ever made will be there, too … even the extinct ones? After all, if the new heavens and the new earth are all about a restored creation, then wouldn’t filling that restored creation with every animal God ever made be part of that plan? We’re not just talking about dinosaurs here, but also the dodo bird, the saber-toothed tiger, even the woolly mammoth. To leave out extinct creatures would seem to give victory to death and Satan—perhaps tantamount to saying there are some parts of His creation that God can’t restore. Of course, this is all up to God. But it’s hard to imagine animals not being in heaven. They are amazing and spectacular creations. We take vacations across the continent and world to see them in the wild, and each weekend, flock to zoos to catch a glimpse. And dinosaurs? They’re arguably the most incredible land animals God ever made. If animals are in heaven, surely dinosaurs will be there, too. So when my son asks “will dinosaurs be in heaven?” I answer with a (somewhat) confident “yes.” I’m looking forward to seeing a T. rex and a triceratops there, but —I tell my son—I’m looking more forward to seeing Jesus Himself—the Creator of those huge animals. Still, it surely will be fun for my son to play “triceratops” … right alongside a real triceratops. This entry was posted in Parents of infants, Parents of toddlers, Parents of young children and tagged Christ, creation, creationism, dinosaurs, dinosaurs in heaven, extinct, glory, God, heaven, old earth, young earth. Bookmark the permalink. It isn’t that dinosaurs “will be” in heaven. They are in heaven now. The heavenly country is 1500 cubic miles and God didn’t make the land animals to become extinct forever, because they were made to inhabit the earth with us. And the heavenly country is not void of animals either. They exist there. There’s also Psalm 104, which reads like a mini Bible from Creation to the final Consummation of history. Toward the end it mentions the Leviathan (104:26) and then says, “When you send your Spirit, THEY are created, and you renew the face of the earth.” (104:30). May I mentioned that Maybe God is a Dinosaur. Haha! Just kidding, I’m athiest.